Letters to Charlotte: Two Years! Happy Birthday! We’ve had a full two days of celebrating you, and you are really digging the attention, presents and CAKE. Yesterday, we started the day with a breakfast party with your Grammie, Uncle David (with whom you share a birthday), Aunt Hannah, Theo, and Uncle Peter. 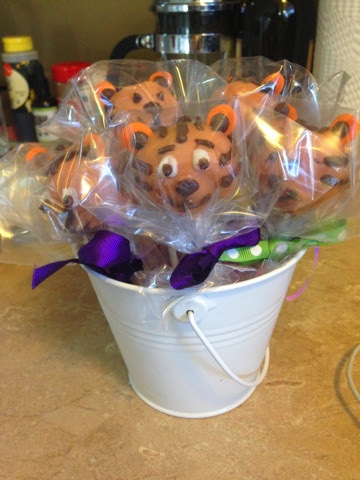 Aunt Hannah surprised you with these adorable Daniel Tiger cake pops. You polished off two of those at breakfast. Then, after an afternoon visit from Aunt Robin and Megan, we had a second family party with Grandmommy and Dear, Aunt Brittany and Uncle Tim, and Cooper and Quincey. You got loads of presents, dined on tacos, and of course, birthday cake. Today, your actual birthday, was also full of friends and fun. Mommy had Bible study this morning, so you got to hang out with your church friends at Sonshine class, and then this afternoon we went to another friend’s house for more cake and play. For your birthday, Mommy and Daddy gave you a set of magnetic paper dolls, a few books, a nice set of wood blocks, and a BIG GIRL BED! Although I’m nowhere near ready for you to sleep in it just yet (you do great in your crib and have never once tried to climb out) it’s nice that it’s there and set up for when you are ready to transition. Tell me, if anything isn’t working the way you want it to, that it’s “broken and needs batteries”. Have a strong will and feisty personality, but are generally agreeable and obedient. Charlotte, this is the last of your monthly letters, and the last of me trying to capture some good pictures with these monthly stickers. I hope that when you read these some day, you will know how much I love you and how special and treasured you are. 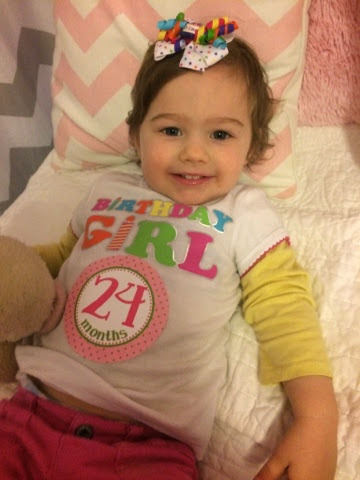 I love you sweet girl- Happy, Happy Birthday! I realized on Friday that Charlotte was exactly, to the day, the same age Grayson was the day he was diagnosed with Leigh’s, eleven days before his second birthday. That kind of baffles me. 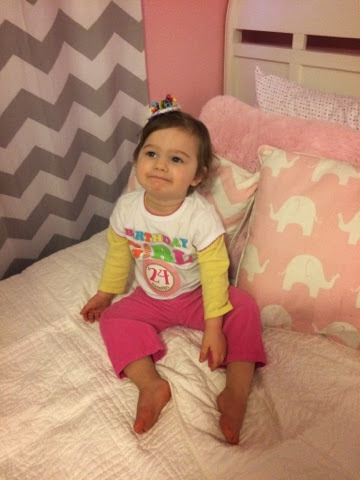 How is Charlotte already that old? Time is so strange- it seems like we went through so much more and it took so much longer for Grayson to reach two years than it did Charlotte. And I guess it did. When I think about all the doctors appointments, therapy sessions, diagnostic tests, hospital stays and surgeries we crammed into two years, on top of just the life changing event of becoming a parent, I’m kind of amazed that I made it though that time with any kind of sanity intact. During Grayson’s first two years, it seemed like I was always waiting. Waiting in doctor’s waiting rooms, waiting on huge test results and a diagnosis, and waiting on phone calls to schedule more doctors appointments and diagnostic tests. And then there was the waiting that never produced the results I was waiting on. I don’t remember the exact age he was when I realized Grayson would never sit up on his own, but for some reason, that particular milestone was the one I focused on for so long. I thought, if we just do enough therapy and exercises at home, get him bigger, and get him stronger, surely it will happen. And it never did. And unfortunately, today, Grayson’s spasticity in his waist/trunk has gotten so severe that it’s really difficult to even force him into a propped sitting position. Maybe that’s why those first two years with Grayson seemed so much longer than Charlotte’s first two years have- his development moved at a snails pace and therefore so did time. With Charlotte, the speed that she changes-both physically and cognitively- just astounds me . And maybe I also needed time to move slower with Grayson so I could process everything that was happening and deal with the emotions that came along with that. We don’t do much waiting anymore when it comes to Grayson. On any given day, his life is extremely routine and predictable, or it’s the complete opposite. On a normal (not sick and in the hospital) day, his routine and schedule varies very little, which keeps him calm and stable. This is why I find it difficult to blog about Grayson these days- every day is mostly the same. He isn’t learning new things, meeting any milestones or saying funny things. He still goes to the doctor a lot more than a typical kid, but it’s nowhere near the amount of appointments he had when he was a baby. And the vast majority of his appointments are boring and routine, in contrast to before when we never knew what we were going to find out every time we drove down to the Med Center. Grayson won’t be with us forever, so for now, I am mostly fine with the slowness and routine of his days. We do a lot of sitting and snuggling on the couch, and in the midst of toddler craziness and general life busyness, I’ll take as many of those quiet, slow moments as I can get. Grayson is always my teacher. A few weeks ago, this article was circulating- a letter to siblings of special needs kids telling them how amazing they are. It really is a feel-good, idealistic letter, and contains everything I hope and pray for Charlotte as she grows up in a family with a unique sibling situation. Then I read the comments. Never read the comments. While there are many parents and siblings of special needs kids who absolutely loved the article, there were of course those who hated it- who felt it was unrealistic and didn’t address the real challenges faced in these sibling relationships. There are a lot of comments from siblings who grew up to suffer from anxiety and depression, and who felt “invisible” in their families. To be honest, it shocked me and kind of made me feel sick to my stomach. At this point, I can’t imagine Charlotte feeling invisible. She is the opposite of invisible. If anything she demands and gets WAY more attention than her brother. She gets at least 6 hours a day of one-on-one time with me while Grayson is at school, and even we are all home, it’s the Charlotte Show. I know part of it is her age, and part of it is her outgoing, energetic, sociable personality. 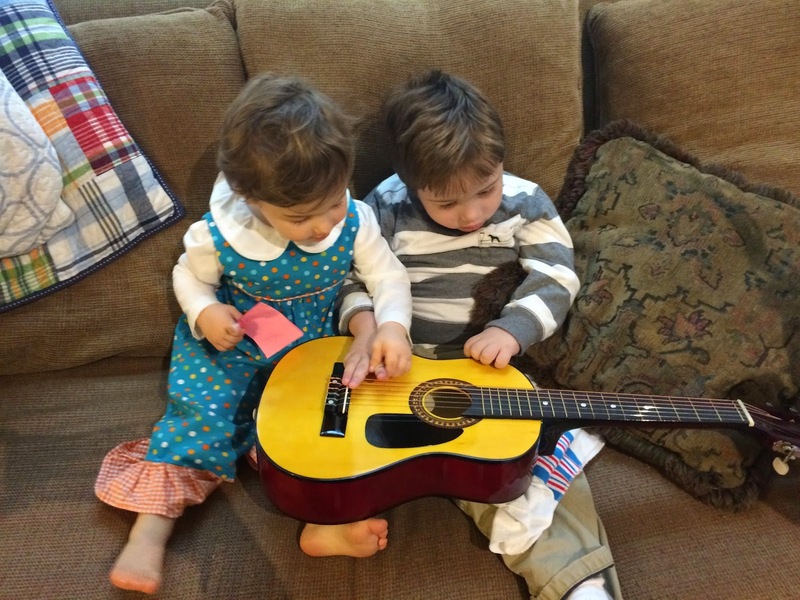 Charlotte adores her brother, and anticipates what he needs. Just this afternoon, the first thing she did when we got home from school pickup was bring Grayson his ipad, his chew-stick, and a blanket in case he got sick. She really does have a tender heart towards him. Case in point: I mean…have you ever seen anything so sweet? But this sweetness is not every minute of the day. Lately, I’ve started noticing jealousy creeping in. She doesn’t like me (or anyone) paying attention to G and not her. Any toy/ipad/instrument that we try to engage him with, she wants. There are tantrums, and sometimes, even physical aggression towards her brother. Again, I realize this is an age thing and would be happening even if Grayson was a typical kid. But it brings up a point made by some of those commenters- siblings of special needs kids are still just kids. They aren’t heroes, or saints, or martyrs. They didn’t ask to be in this situation, and aren’t going to grow up to be extraordinary human beings just because of the home they grow up in. It makes me, and I think most special needs parents, uncomfortable when people call me Super-Mom or tell me they have no idea how I do it or that they could never do it. Yeah, you could. There’s nothing special about me- I just love my kid and do what I can to give him a good life. Same with Charlotte. Yes, I hope the experience of growing up seeing what she does and will see in the future will give her an appreciation for life, an empathetic heart, and a desire to serve others, but I don’t want her to feel added pressure or expectations because of who her brother is. And I never want her to feel invisible or that she matters less because she is healthy and will have less physical needs as time passes. It’s hard for me to imagine how Charlotte’s life and personality will really be shaped by her role as a special needs sibling, and it’s scary to think that the experience could affect her in a really negative way. But just like everything else, I’ll take it one day at a time, pray a lot, and treasure the moments of the special bond these two share. Happy New Year! Our holiday season turned out pretty great- we spent a ton of time with family, ate a lot of food, celebrated the birth of Jesus, and gave and received some pretty awesome gifts. But I’m glad it’s over. I’m ready for routine, back-to-school, and the promise of a fresh start. 2014 was a decent year. Our 2013 was so overwhelming and tumultuous, and it was nice to have a year that didn’t have so many crazy emotional extremes. We’ve been settled in our new house for almost a full year now, and for the most part, I’m content living here. It’s not big, new or fancy, but it meets our family’s needs, and that is just what we need at this point. I’m so thankful that Grayson had a good year too. I’m not sure how many times he was in the hospital in 2014, but it seems like it was less than last year, and each hospital stay he bounced back fairly quickly. I’ve accepted that it’s when, not if, he’s in the hospital the next time, and we have the hospital routine figured out. It’s disruptive for sure, but we know what to expect. Charlotte continues to light up our lives and cause me to fall asleep in bed at 8:40 pm on NYE (true story). 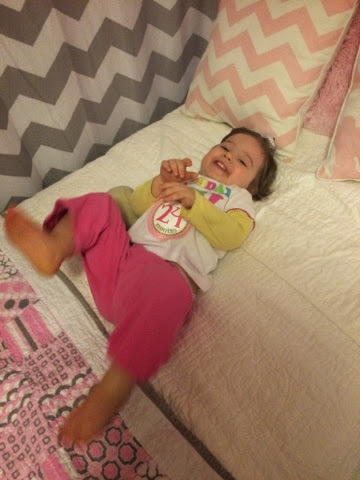 She is hilarious, sweet, so smart, and exhausting. And she never stops talking. What a blessing it’s been this year to be with her as she’s transformed from a baby to a toddler. 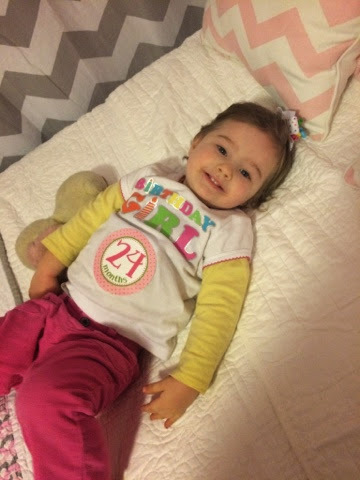 Her phase of today was “Happy Birthday New Year”! I learned a lot this year. I really believe I’ve made small steps towards understanding and embracing people who are different than me, and I want to continue to try and look at issues from all different points of view. If I were to choose a word I want to live by for 2015 it would be “brave”. I want to tackle my life with excitement and anticipation, not fear. The fear of the unknown and “what ifs” keep me up in the wee hours of the night far too often. I want to make decisions and feel confident in them, and not spend so much time fearing the reaction of others to those decisions. We have some exciting things planned for the coming year and I can’t wait to see where it takes us.